You don’t have to be “mentally weak” to be hypnotized. The first myth about hypnotherapy is that to be hypnotized you must be weak minded. In reality, people who are able to concentrate and have a strong sense of creativity are most likely to be successful subjects of hypnotherapy. Every time we daydream, use our imagination, or take on a task with intense concentration, we enter a form of a hypnotic trance. Hypnotized people maintain their free will. The old “quack like a duck” trope has led to the very popular misconception that patients surrender all control of themselves during a hypnotherapy session. On the contrary, a patient’s mind is fully aware during a hypnotherapy session, and clients can pull themselves out of the trance-like state at any point during the session. That’s the definition of free will. We delved deeper into the question of whether hypnotherapy clients “lose control” in a recent blog post — read it for more information that debunks this myth. Hypnotized clients do not reveal deep secrets against their will. There’s a myth that hypnotherapy can be used to manipulate clients to reveal facts about themselves that they ordinarily wouldn’t — that is false. It is true that during hypnotherapy sessions, clients may learn things about themselves that they have previously forgotten or perhaps never consciously knew. This often assists them to discover a deeper understanding of actions, experiences and feelings that have been previously confusing to them. Clients reveal only what they are ready to learn about themselves during a hypnotherapy session. The mind is actually extremely conscious during these treatments, and the client is not asleep or unconscious. No one is ever forced to share anything against their will. We have observed over 30 years and tens of thousands of sessions, that the subconscious mind has an amazing ability to censor what the client may not be ready to know! Hypnotherapy is not a mystical practice. Another myth about hypnotherapy is that it’s a mystical practice — or, at the other end of the spectrum, that it’s valid for use only as a treatment for weight loss or smoking cessation. Hypnotherapy is a clinical practice, just like any other form of psychotherapy, used to treat a wide variety of mental, physical and emotional issues. With the assistance of a professionally trained clinician, clients choose hypnotherapy as a powerful method to reach a trance-like state of heightened focus and concentration. It’s been supported by the BMA since the 1800s, and the American Medical Association and British Psychological Society have officially supported hypnotherapy since the 1950s (read our blog post about those organizations’ support for hypnotherapy). And that’s just the tip of the iceberg. And the United States National Institutes of Health found “evidence supporting the effectiveness of hypnosis in alleviating chronic pain associated with cancer,” as well as irritable bowel syndrome, oral mucositis and tension headaches. People may have the idea that a hypnotherapist is gifted with mystical powers. A hypnotherapist is someone who has been trained and is practiced in the art and science of hypnosis — most well-educated individuals can learn to facilitate this exciting self-discovery process with proper training. The real gift lies in the client’s specific subconscious mind, incorporating a vast amount of dynamic personal history and valuable information, which leads to self-discovery and personal transformation. Hypnotherapists are well educated in the field of psychology and use it as just one tool in their practice of helping people to heal and to expand their consciousness. Hypnotherapists are the opposite of mind controllers; they actually act as guides through the hypnotherapy experience. Most certified graduates from The Wellness Institute, for example, has either a Master’s Degree or a Psy.D., or is working on these degrees through our graduate school. Many of them are practicing therapists in their own private practices, or as part of a larger practice. There’s abundant proof that hypnotherapy works. One of the most common myths about hypnotherapy — that there’s no proof that hypnotherapy works — is also the most untrue of them all. As we’ve mentioned previously in this article, many respected psychoanalysts, both historical and present-day, have successfully used the practice of hypnotherapy in their work. Its effectiveness has been proven again and again, and a variety of medical and scientific organizations — including the American Medical Association, American Psychological Association, British Medical Association, and British Psychological Society — have independently endorsed hypnotherapy as a valid form of treatment. 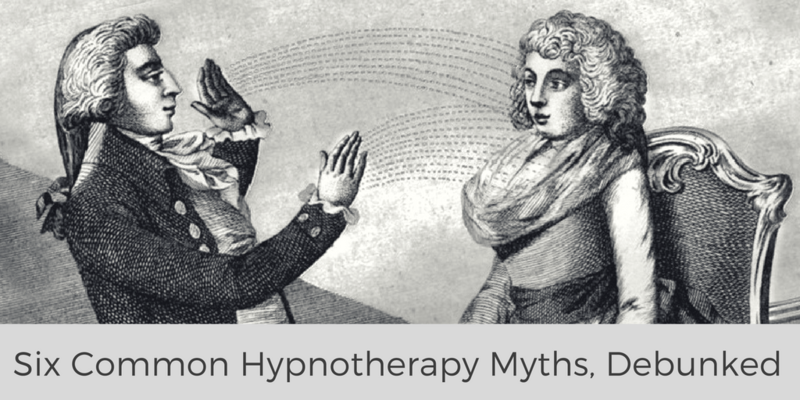 What other myths and misconceptions about hypnotherapy have you encountered? Do you have any misconceptions of your own that you’d like the Wellness Institute to clear up? We’d love to help the world understand hypnotherapy more clearly. The Wellness Institute has developed a free e-book that tackles six more myths and misconceptions around hypnotherapy and hypnotherapy training. Ready to learn more? Click the button below.